I was recently asked to review some new thumbdrives from USB Memory Direct. Branded and cool, I can fit your retouched event shoots (as jpegs) for many of my small to medium jobs. As for advertising or video jobs, I’ll still need to buy big1- 3TB drives, but for smaller events like NYFW photography or your destination wedding, these are perfect. 8GB is ideal for approximately 75 high res files. Since I have a long name, my logo, is a challenge to get printed. But the black + greylightweight letters looks sharp as heck on the light wood model. Salesperson Taylor Chastain helped me through every step of the process; guiding me to the right style and color. She suggested the Tower model and I loved it right away. Another nice feature is the snazzy, magnetic closure. This means the cap won’t loosen and fall off in your bag. After having tested these new flash drives, I am confident I can put your job on one of these and hand it to you as backup. I will still always deliver the job through a secure portal to you as well. However, these are great to have the job right in your pocket. The logo is an added bonus. You will always remember the work we did together. 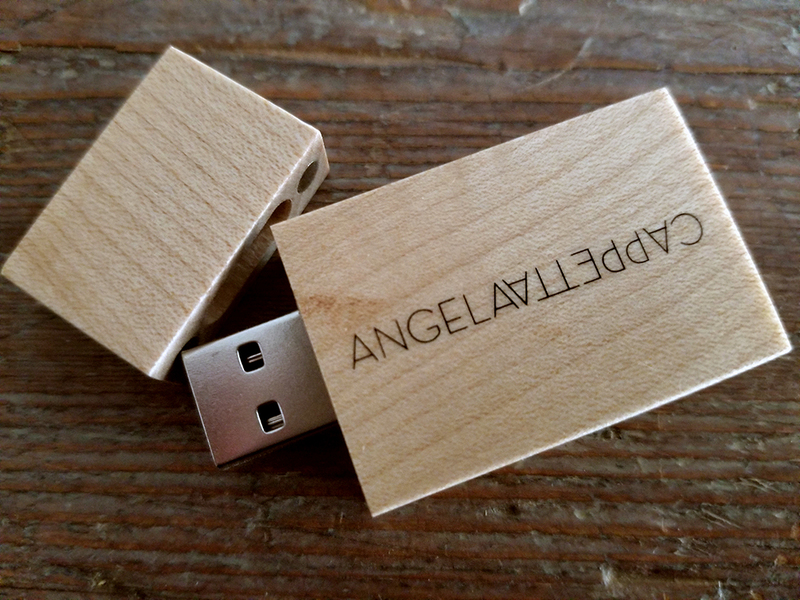 Custom 8GB thumb drive with Angela Cappetta’s branding.